Lee Hinson-Hasty is senior director for Theological Education Funds Development for the Committee on Theological Education (COTE) of the Presbyterian Church (USA) and the Presbyterian Foundation, a promotion in 2015 after a decade of service to COTE as the coordinator for Theological Education and Seminary Relations. 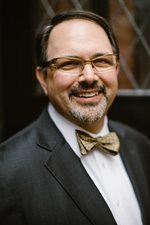 Ordained in 1995, he has served as a campus minister and pastor in Virginia and as director of church relations at St. Andrews Presbyterian College in North Carolina. The Rev. Dr. Hinson-Hasty actively seeks support of future ministers and our twelve Presbyterian Church (USA) Seminaries through the Theological Education Fund (TEF) and Theological Schools Endowment Fund, engages in dialogue, study and initiatives that foster relationships and leadership development in the church and academy. He served the board of the Forum for Theological Exploration (FTE) (2012-2017) that he chaired from (2014-2016), has been nominated to serve on the board of the Foundation for Theological Education in Southeast Asia (FTESEA), is active in the Association of Theological Schools in the United States and Canada (ATS), is a member of a clergy lectionary study group – Lectio Jubilate, the American Academy of Religion, and the Academy of Religious Leadership. He studied in Venice, Italy; Rüschlikon, Switzerland; and Debrecen, Hungary, which is regarded as the Calvinist Rome. The author of numerous published essays and articles, the Rev. Dr. Hinson-Hasty also writes the blog commentary, Theological Education Matters: Stories from Presbyterian Church (USA) Seminaries, pastors, friends, and all who care about theological education. He earned a Bachelor of Arts degree in history from Wake Forest University, a Master of Divinity degree from Louisville Seminary, and a Doctor of Ministry degree from McCormick Theological Seminary, where his scholarship focused on leadership in a multicultural world. Lee is married to the Rev. Dr. Elizabeth Hinson-Hasty, chair of the theology department at Bellarmine University in Louisville, KY. They are parents to Garrison (18), Emmeline (12), and Bacsi, their four-year-old Cavalier King Charles Spaniel.